What Day Of The Week Is September 20? 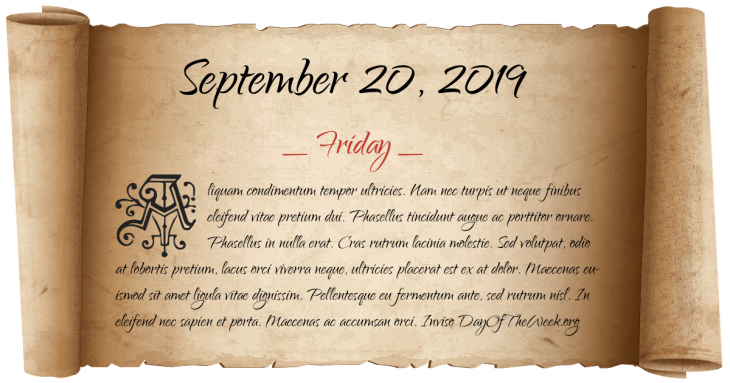 September 20, 2019 is the 263rd day of the year 2019 in the Gregorian calendar. There are 102 days remaining until the end of the year. The day of the week is Friday. The 1498 Meiō Nankaidō earthquake generates a tsunami that washes away the building housing the statue of the Great Buddha at Kōtoku-in in Kamakura, Kanagawa, Japan; since then the Buddha has sat in the open air. The Treaty of Rijswijk is signed by France, England, Spain, the Holy Roman Empire and the Dutch Republic ending the Nine Years’ War (1688–97). Bersaglieri corps enter Rome through the Porta Pia and complete the unification of Italy. James Meredith, an African-American, is temporarily barred from entering the University of Mississippi. Billie Jean King beats Bobby Riggs in The Battle of the Sexes tennis match at the Houston Astrodome in Houston, Texas. Who were born on September 20?